Old Salem is a popular historic district in Winston-Salem and serves as an educational tool and showcase for those who want to come and learn about Moravians in North Carolina, who established the Piedmont community in the late 18th century. One can easily spend a day or more visiting the various shops, historic buildings, gardens, and everything else that makes up the place. Since there’s so much to take in, we want to share with you eight ways you can explore Old Salem and get the most of your time there. When looking into what to do in Winston-Salem, Old Salem easily made our list for a weekend in the city. It also featured in our guide to North Carolina’s museums and our year-round collection of Unique Things to Do in North Carolina. Our Thoughts and Yours, Too! Without a ticket, you’re not able to learn as much as we did. During open hours, you’ll get access to people who know just about everything about Salem and its background. 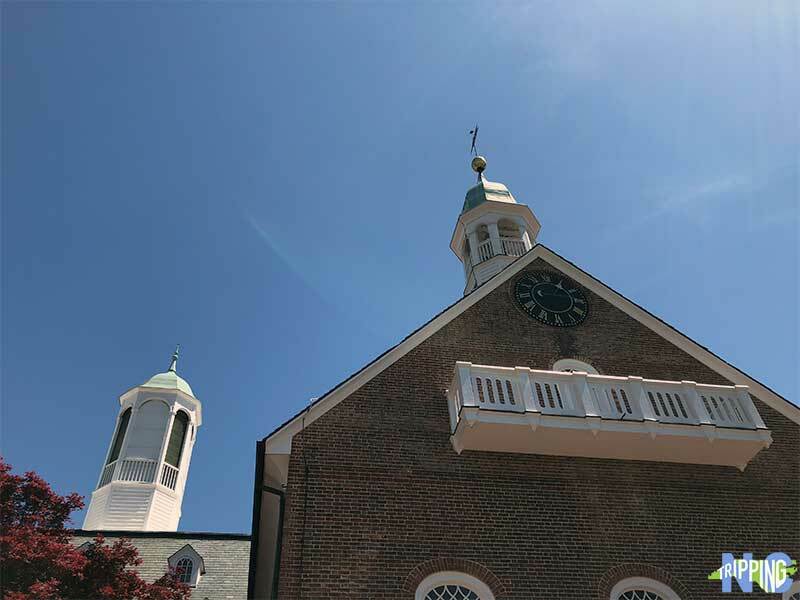 After buying a ticket at the Visitor Center, you get access to the Shultz Shoemaker Shop, the African Moravian Log Church, and more buildings filled with history and kind people who want to share it with you. Of course, you don’t have to jam it all into one day. The ALL-IN-ONE ticket grants you entry for two consecutive days. This is great if you live in the area or don’t want to do it all in one day. There’s so much history to explore at Old Salem. If you’re interested in learning more before visiting, Moravians in North Carolina shares a pictorial history of the town, as well as other similar settlements in the Tar Heel State. It’s just as important to learn about African-American contributions to Old Salem as it is to eat Moravian Cookies (see below). 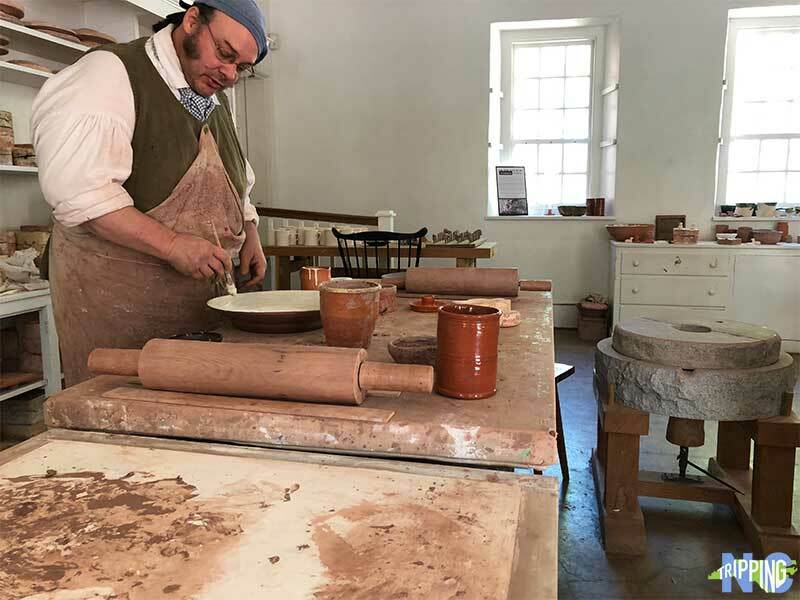 Their contributions to the community formed the backbone and beyond, as many Black Moravians were skilled potters, carpenters, and even translators for the bilingual community. Recent efforts are working to expand upon what’s presented to visitors at Old Salem. Note: Initiatives like Slave Dwelling Project and Hidden Town Project are working to better inform young people and folks in general about the legacy of Moravians, regardless of skin color. If there’s something more happening to bring light to African-American history in and around Old Salem, we’d love to know about it. 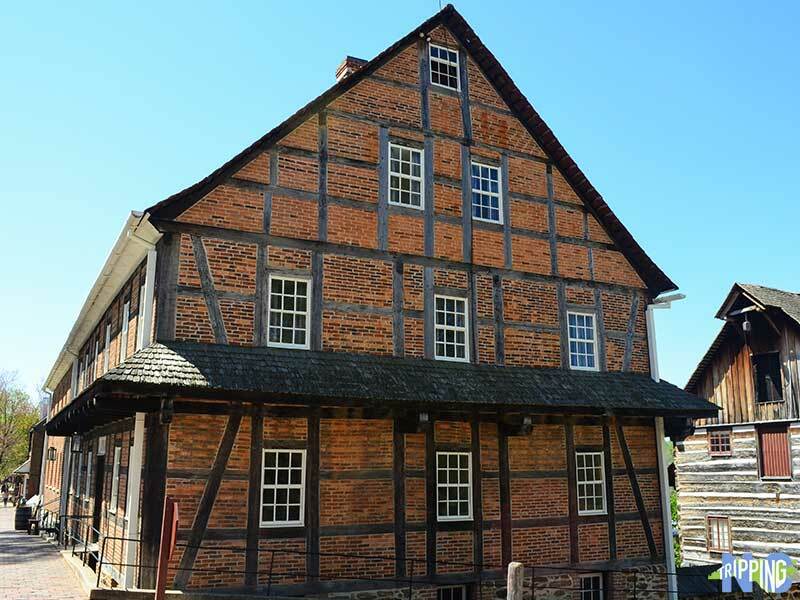 Intertwined with all the history that you’ll learn while visiting Old Salem is the architecture. There are some cool buildings with varying influences. You’ll encounter Central European influences, mixed with Greek Revival, and other remnants of early American styles. Even though there are cars on the street while you walk around, it’s lovely to walk around Main Street’s cobblestone sidewalks and soak in Old Salem’s architecture. Old Salem’s historic and sustainable gardens are admirable, not because they are flashy and full of beautiful flowers. These individual plots are functional, sustainable, and have been a part of the community since its inception in 1766. If the season is right, you’ll find spots like the Miksch Garden filled with various fruits, vegetables, grains, and more. Landscape lovers and history nerds (like me) will enjoy The Gardens of Salem by Darrell Spencer and photographer Virginia Weiler! I’m a sucker for souvenirs (magnets!) and was happy to grab one from the Old Salem Visitor Center. If you’re into shopping, Old Salem has some cool places to buy something. Other than the Visitor Center, you can grab fun stuff at the Moravian Book & Gift Shop, the T. Bagge Merchant & Garden Shop, and the A. Butner Hat Shop. Just keep in mind that hours vary, so plan accordingly. One of the most fun things to do in Winston-Salem is to eat at Old Salem. 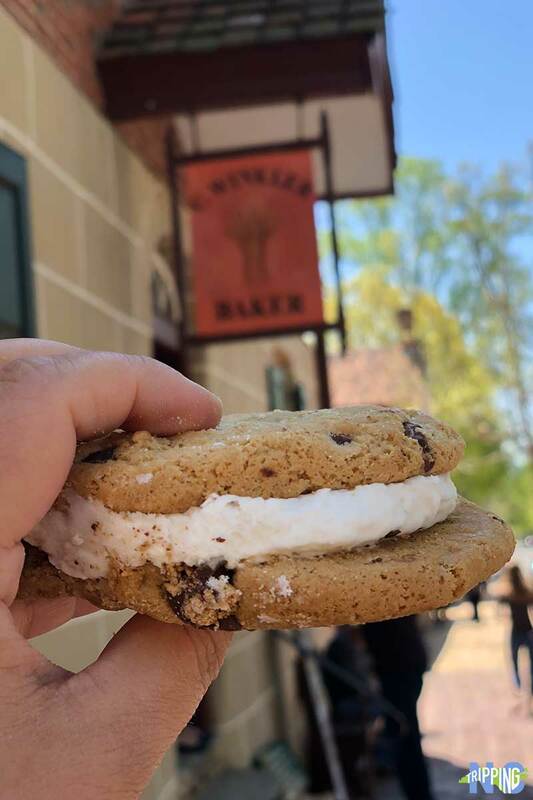 Winkler Bakery is the way to go for some delicious Moravian cookies, bread, or both. If you can get in early, you might be able to grab a table and enjoy some locally farmed food at The Tavern in Old Salem. You can also grab delicious English-style tea and small bites at The Flour Box Tea Room & Cafe. Both The Tavern and The Flour Box fill up on weekends and especially holidays, so plan accordingly. North Carolina and Old Salem Cookery takes you through cooking and eating like a Moravian if you’d like to study beforehand. 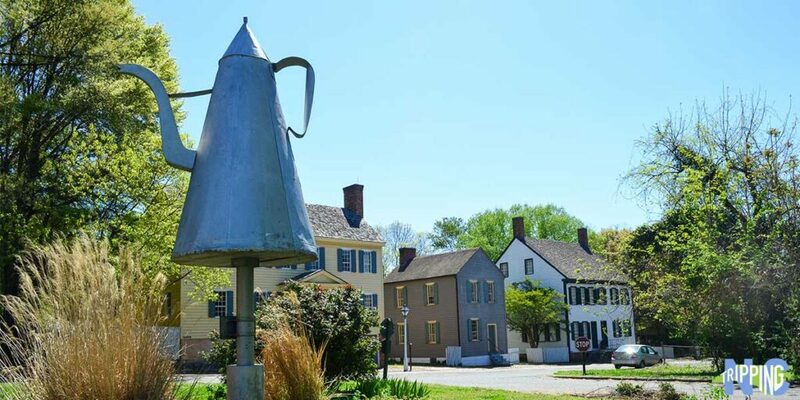 We’re nerds for landmarks like the famed Salem Coffee Pot. 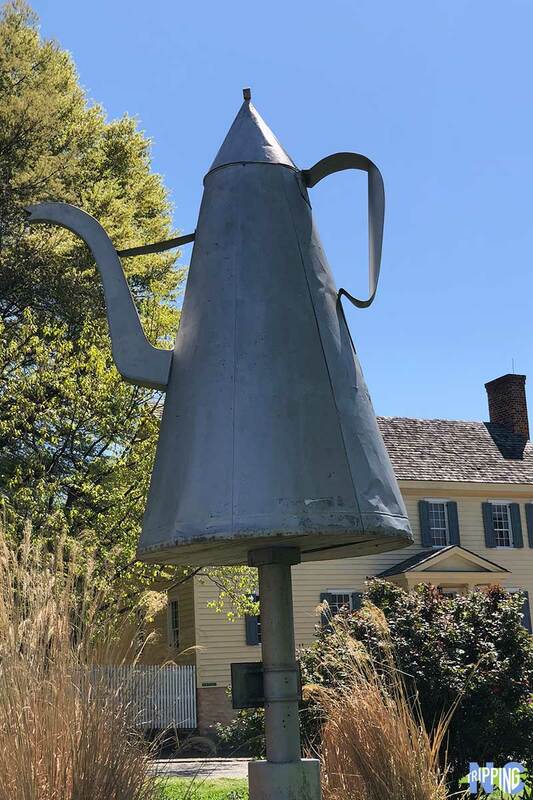 Found at the junction of South Main Street, Old Salem Road, and Brookstown Avenue, this 7-foot-tall tin pot is great for photos. There’s also a cool backstory behind it. According to one source, the pot separated Salem from Winston, as the latter was viewed as a threat to young ladies’ virtue. Old Salem invites a variety of groups to come and visit, too. Schools love to come here, but many adults flock in unison as well. Another way to get in on the interactive fun is via the Museum of Early Southern Decorative Arts (MESDA) that you’ll see immediately after crossing the Heritage Bridge from the Visitor Center. They offer various tours and ticket packages for visitors, with an emphasis on getting behind the scenes at the museum. We love Old Salem and think it’s one of the best things to do in Winston-Salem. There are fun special events happening throughout the year and there’s even a Cobblestone Farmers Market open Saturday mornings between April and November. This entry was posted in Travel and tagged Forsyth County, Old Salem, The Piedmont, The Piedmont Triad, Winston-Salem. I'm a writer and recovering American expat who shares my family's travels through North Carolina and life in general. I am part of a two-person team here and at Travel Through Life. What is between those cookies? Ice cream? Whipped cream? Looks wonderful. That was some cream and made it taste like the most epic cream pie I’ve ever had. Thanks for stopping by, Charles! Hope you can check out Old Salem sometime! I’ve never been to Old Salem but the old architecture and that giant pot are calling me. Thanks for adding a new destination to my travel list! Awesome! Hope you can make it to Old Salem someday soon, Julie. The giant Coffee Pot awaits! Thank you for stopping by and commenting. The coffee pot, originally an advertisement for the tinsmith, has had several locations over the years. At one point, the coffee pot was as far north as Salem College girls could venture without signing out. Interesting story. Quite an adventurous coffee pot, no? Thanks for sharing and for stopping by, Mary! My daughter currently attends Salem College, and I absolutely love strolling around Old Salem whenever I come for a visit. The Moravian chicken pie at the Tavern in Old Salem is fantastic, as well as the sugar cake at Winkler’s Bakery. Old Salem is especially beautiful during the holiday season, and I highly recommend taking one of the holiday candlelight walking tours. The decorations are so beautiful, and the tours are very interactive with the craftspeople and historic interpretors. 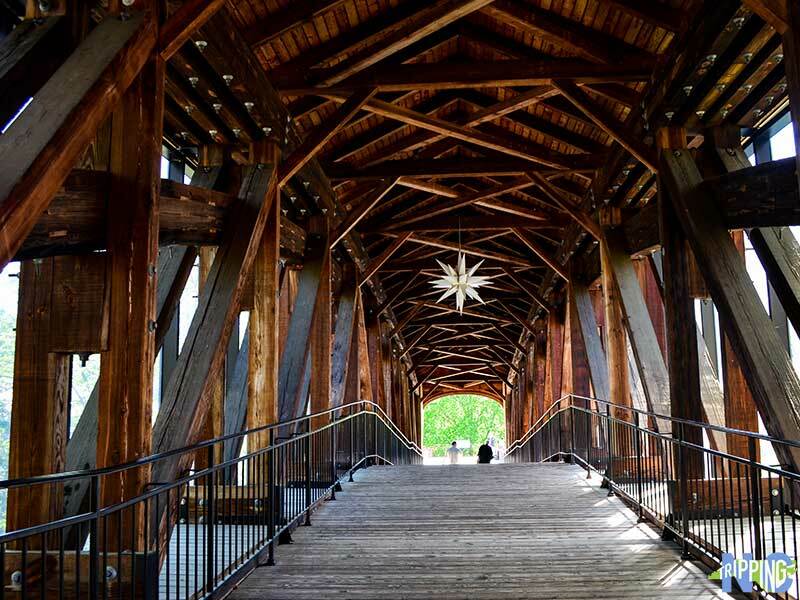 And you have to take a peek at the Heritage Bridge lit up with Moravian stars. Thank you so much, Karen. We’ll definitely have to check out Old Salem during the holidays. Appreciate you stopping by and letting us know about it!